Save time and money with the EDGE chemical free floor stripping system, safer for the environment and the operator, removing polish has never been easier. 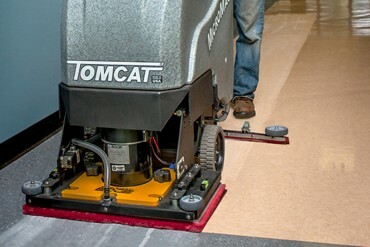 TomCat scrubber driers can remove most floor sealers without using harmful chemicals, using just water the floor is dry and ready to re-seal in minutes. Removing floor polish using the traditional method is messy and time consuming, using dangerous chemicals that melt the polish into a slippery mess, which needs to be removed, rinsed and left to dry before new polish can be re-applied. All of the polish has to be removed with this process due to the chemical reaction. The EDGE chemical free floor stripping system just uses water and a special floor pad , you don't need to remove all of the old polish, just skim of as much old polish as required and re-apply. Our EDGE models are a favourite with the operator as they clean right up to the wall, so you don't have to finish by hand. Safer for the environment and the operator..
T C Cleaning Machines shared a link.